President Obama has eased travel restrictions for Americans who want to go to Cuba. But if you want to go sit on the beach and smoke Cuban cigars and sip rum and cola, you might be out of luck. Travel to Cuba still must fall into one of 12 categories designed to promote contact and communication between Americans and Cubans. These include family visits, educational research, charitable and humanitarian efforts, athletic or cultural competitions, and more. Tourism, though, is not one of those categories, and in fact, Americans still are prohibited by law from traveling to Cuba strictly as tourists. 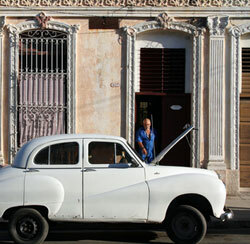 However, people traveling to Cuba no longer need a specific license to travel legally to Cuba from the United States. (For years, Americans have traveled illegally to Cuba from other countries.) Getting a travel license used to be a lengthy process involving a lot of paperwork and a lot of waiting for the piece of paper that gave permission to make the trip. Now, though, travelers only need a general license, which means that the traveler declares he or she falls into one of the allowed categories. Still, you can’t call the airlines and book a flight. Although airlines are expected to start negotiating to be allowed to fly commercial flights from the United States into Cuba, currently Americans must visit the island on an approved charter flight through a travel company that is licensed by the U.S. government to go to Cuba. The United States also has lifted restrictions on U.S. banks doing business in Cuba. In the past, travelers with U.S. bank credit and debit cards could not use the cards in Cuba; they had to carry enough cash to cover their expenses. Theoretically, U.S. bank cards now will work in Cuba. In fact, though, it will be some time before the necessary banking infrastructure is set up and working. So if you go to Cuba soon, you should expect to pay in cash. Finally, you can bring back Cuban rum and cigars – though not enough to start your own business. Under the new regulations, Americans can bring back $100 worth of cigars and alcohol as part of the $400 in goods you can bring through customs.